Unless you are harboring some serious mother issues, Back to the Future has never been considered an 80s horror comedy crossover in, say, the way movies such as Gremlins and Ghostbusters are. But it does have its occasional bouts of 80s violence. 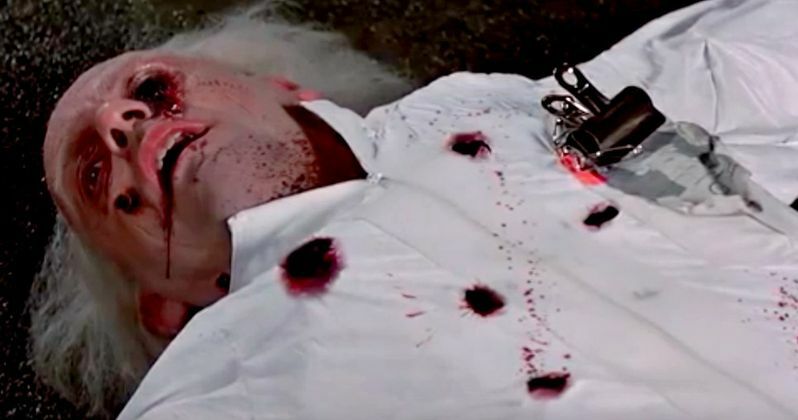 Now, one fan is taking that to the ultimate degree, offering up a version of the movie that showers Doc Brown and Marty in gore, blood and violence. When it comes to Back to the Future, there is something for almost everyone. Time travel, comedy, sci-fi, action, romance and Crispin Glover. The one thing it's seriously lacking in is blood, even though there is a little bit of that too. Now, there is a whole bunch. And if you like watching your favorite movie characters get gruesomely murdered, this latest Youtube viral video delivers that in buckets of ooze. 'Run for it Marty, The Libyans!!' That is Doc Brown's final cry as the Libyans he stole the plutonium from to power his DeLorean Time Machine find Doc and his teenage friend doing their experiment at the mall. Things take a turn for the OMG when the Libyan terrorists catch up with Doc and shower him with bullets. It's the shocking death that was always there, in a PG rated movie. Only now it has been heightened into a good old fashion bit of ultra violence. This video comes from BitMassive, who over the holidays won some acclaim and went viral with their bloody and brutal fan cut clips from Home Alone. That John Hughes classic starring Macaulay Culkin took things to the next level, replacing all of the cartoon violence with the real thing. The Wet Bandits are knocked out with 'real' bricks, bludgeoned and violently beaten, with their bodies taking on the real physical weight of what such actions would actually do to a person. And it's something you simply can't unsee. Those videos became a viral hit on the Internet and were shared all throughout Christmas. Now, it seems that they are going to continue the trend, bloodying up other classics from the 80s and 90s. If they take this kind of stance with Back to the Future, we can only imagine what is coming next. Perhaps they'll kill everyone off on Full House. Or shower Goonies in a rich thick crimson spray. We have the Back to The Future clip in all its glory here. And you'll never be able to shake these gruesome images. They put a whole different spin on Doc Brown's untimely death, and make Marty's urgency to return and save his doomed friend all the more important. And it now makes the end climax, where Doc Brown is trying to connect the cables, seem even more on edge. Take a look as BitMassive showers Doc Brown in pools of deep red. But know your childhood will never be quite the same.